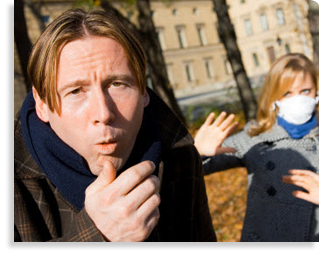 A persistent cough can be one of the most annoying symptoms of the common cold or flu virus. Whether you’re hunched over your desk, braving the grocery store, or attending your kids’ soccer game, the constant urge to cough can cause both ongoing irritation to your already sensitive respiratory tract and embarrassing, unwanted attention. Of course the best remedy for the common cold and its resulting symptoms is plenty of fluids and lots and lots of rest. Unfortunately, for most of us, sleeping the day away simply isn’t an option. When you have to be on your feet, you can manage your cough (and other cold and flu symptoms) with OTC cough remedy like Contac® Cold + Flu. This strong multi-symptom reliever has both day and night formulations to keep you going when necessary, and helps you rest when the day is finally done. Not sure which Contac® Cold + Flu formulation is right to help manage your coughing? It helps to know a little more about your symptoms. Coughing can be divided into two primary types: productive and nonproductive. Productive coughing is an attempt to clear the lungs and breathing passages of mucus or phlegm. If you have a cold, you’re likely also experiencing some form of post-nasal drip or nasal congestion which can contribute to mucus in the throat. 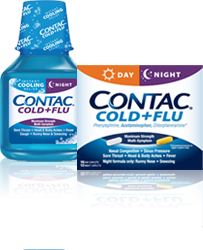 A multi-symptom OTC medication like Contac® Cold + Flu, along with plenty of water and warm fluids, can help manage both symptoms. Nonproductive coughing, also called “dry coughing,” is indicated by that irritating tickle in your throat or chest. It is common in allergy sufferers or after a cold or flu and may last several weeks longer than other symptoms. Some people find that nonproductive coughs seem to get worse at night. In the cases of dry-coughing, cough-suppressants can be used to manage the urge to cough, since you are no longer expectorating any mucus and therefore simply irritating the sensitive tissue. Acute coughing (coughing that lasts for three weeks or less) from a cold or flu can be managed with cold and flu medicine and lots of fluids. Productive coughing benefits from water which helps to loosen mucus, while nonproductive coughing can benefit from honey in hot water, tea or lemon juice. Adding an OTC cold and flu medication like Contac® Cold + Flu Cooling Relief liquid can help manage cough plus other symptoms like post-nasal drip, which, when left untreated, can contribute to coughing and potential re-infection. Don’t let a persistent cough get in the way of taking care of your family. Contac® Cold + Flu can get you back on your feet again.